Why Do Currency Rates Change? One day you will see the euro quoted at 1.3832 and nine days later, it is 1.3296. (These price quotes are the high on 2013-10-25 to the low on 2013-11-07.) A change in price by 536 points is not abnormal. Later we will talk about what is normal and how we know what is normal, but for the moment, you need to accept that Forex prices can move very far, very fast. What is behind the change? The obvious answer is that euro traders were in the process of changing their minds about the value of either the euro or the value of the dollar. Actually, since no one knows or can even guess what true value might be, the euro trader is guessing what others will think in the future about the appropriate price of the euro or the dollar. If the euro trader is a seller today at 1.3832, it is because he interprets some piece of data or news unfavorable to the euro that will make others not willing to pay as much for it as today’s price. The future may be two minutes, two days or two weeks, but the skill of the trader lies in assigning a probability to the interpretation of the data or news by the rest of the market. In other words, the euro trader is reading their minds about future demand for euros. This sounds ridiculous but it is an accurate way of describing the process. There are three components to the euro trader’s guess. The euro had become “overbought.” This term refers to a majority of euro traders believing the euro should go higher and having already built a big long position. The chart reader does not care whether the rest of the market is correct. He sees that in terms of the upmove that has already taken place, the other traders are overinvested in the bullish point of view. If everyone has already bought the euro and they are out of cash or credit to increase their holdings, there’s nobody left to buy. The price must fall as the holders unload their positions in order to get cash to put on new trades. The chart reader uses any of several technical indicators to identify when the market is overinvested or overbought. The most commonly used indicator is the relative strength index or RSI. Another is the stochastic oscillator. It is important to note that in Forex, we do not have volume figures like the volume available in equity trading. If we had volume, we could see that as the price is rising, volume is failing to keep pace proportionately. A divergence between rising prices and falling volume is a classic technique in equities to gauge when a security is becoming overbought. Alas, in Forex, we do not have volume as a tool. The only reason to buy something is to use it or to sell it later for a higher price. While the Forex trader will not actually use euros in the sense of spending them on goods and services, he anticipates that others will want to use the euro’s purchasing power to buy stuff, not only socks and haircuts but also securities denominated in euros. Therefore, Forex traders follow the macroeconomics and news stories pertaining to the relative purchasing power of the euro vs. the dollar, including inflation (or deflation), wages increases, the robustness of the economy, and so on. At any one time, the market as a whole has a consensus view of which economies are growing and how fast, and which economies have immediate economic problems that the government and specifically the central bank should be addressing. As a rule, traders’ economic understanding is oversimplified and even crude, and usually boiled down to a catchy one or two-word descriptor, but it does not pay to be snobbish about the relative lack of sophistication of these views—they move markets. The macroeconomics form the background against which traders judge news. The single most important piece of news is a change in interest rates or other stimulus/contraction by a central bank. A good example is the interest rate decision by the European Central bank (ECB) on November 7, 2013. Because inflation had fallen to a new low and there was fear of Japanese-style deflation, the consensus of Forex commentators was that the ECB would cut rates or impose negative rates on bank deposits to encourage banks to lend more. Accordingly, the euro was on a sharp falling trajectory. However, the ECB declined to cut rates and the euro reversed on the same day, rising nearly to the level it started eight days earlier. 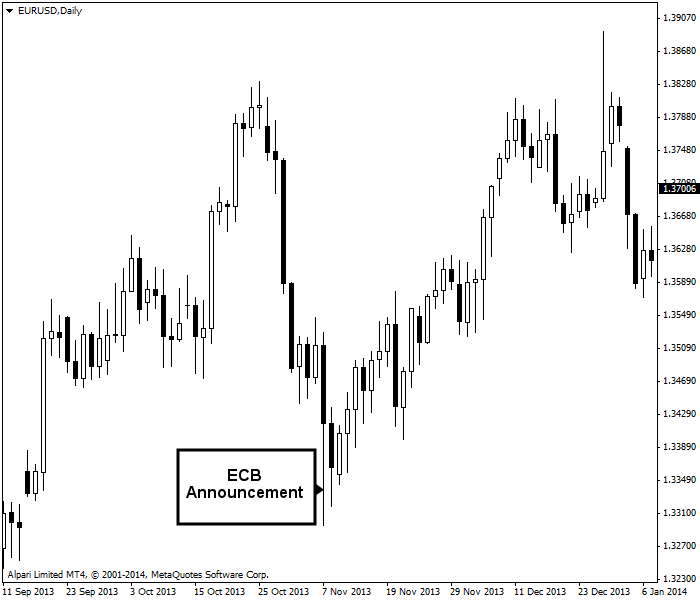 ECB announcement influences EUR/USD in November 2013 — daily chart. You would be hard-pressed to say the euro reversed into an upmove because traders were thinking about purchasing power parity or other relative economic data — here the move was due to the ECB rate decision, made a little stronger because the market’s expectations were proved wrong. You can use our interest rates table to know the current rates set by the world's major central banks and the dates when they have been last changed. 2. Forex traders do not have a consensus view of relative economic conditions. 3. Traders will buy back an oversold currency because of the chart alone regardless of the economics.